Did Ancient Civilization Complex Pulverize 1908 Tunguska Meteorite? Are the mysterious domes that disappeared in the Yakutia region of Siberia–the infamous Valley of Death, a 100,000 square kilometers–related to the still debated 1908 Tunguska Explosion? Are the domes, which some believe are hidden or have sunk into the marshy Siberian terrain, an ancient civilization weapon complex still in use to pulverize meteorites? What piqued our interest the title of video uploaded at Youtube, Mysterious domes in Siberia – radioactive UFO weapons?. The video–posted below–is the Siberia “Valley of Death” episode from the History Channel’s fascinating series Ancient Aliens. Another source, the article Yakutia: Valley of Death, Hidden Mysteries of Siberia authored by Dr Valery Uvarov, the head of the Department of UFO Research, Palaeosciences and Palaeotechnology of the National Security Academy of Russia. 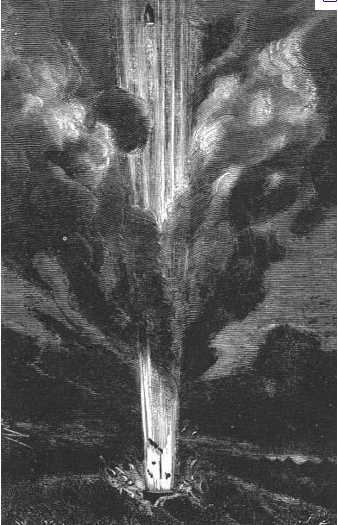 The Uvarov article, far more detailed with firsthand fantastical accounts with what might be a connection between the Yakutia Valley of Death domes and the 1908 Tunguska Explosion and later meteorite events up until 2002. Meteorites which may have met their demise over the skies of Siberia via the Valley of Death Meteorite Doomsday Destroyer Complex. A complex which seems to have auto-protection via making curious humans too ill with a radiation type illness to linger in the area for further exploration and research. According to Ancient Aliens the first scientific expedition into the area occurred in 1854 where several large “domes” were discovered, domes described as “cauldrons”. Sorry, the Wayback Machine does not have this video archived. A small asteroid, designated 2009 DD45, passed the Earth at a distance of 46,000 miles, a near miss in terms of cosmic distances. Though asteroid 2009 DD45 was just about two hundred feet long, it might have impacted with the force of a nuclear blast. Astronomers are comparing asteroid 2009 DD45 to the rock that caused the Tunguska impact of 1908. The 1908 impact occurred in Siberia near the Tunguska River and destroyed the taiga forest at a distance of twenty five kilometers around the epicenter. The Tunguska impact, which was technically an air burst explosion rather than a ground collision, had the force of a multi-megaton nuclear blast. Had asteroid 2009 DD45 hit a populated area, such as a large city, it would have laid it waste. Had asteroid 2009 DD45 hit the ocean it would have caused a tsunami that would have devastated coastlines. Astronomers suggest that asteroid 2009 DD45 is now in a solar orbit that intersects the Earth’s orbit. That means that asteroid 2009 DD45 will be visiting the vicinity of Earth again. For more of this fascinating article with numerous eyewitness accounts the link to Part One, Yuktia: Valley of Death. Writing under the pen name of LBG1, Elaine Marlow Frazier published dozens of articles on the “mysterious, unusual and unexplained” at DBKP/Death By 1000 Papercuts from 2007-2012. These articles were read by literally millions of readers during that period. It is our hope that these articles from the DBKP archives (not available elsewhere on the Internet) may assist some in obtaining information that will prevent them from falling prey to the coming deceptions that are even now being formulated and promoted. Mysterious, Unusual and Unexplained: Mystery Solved! Meteorites from the Tunguska Event – Fodder for 15 Minutes of Fame? © Elaine Marlow Frazier, DBKP and End Times Prophecy Report 2007-2014. © Jeremiah J. Jameson and End Times Prophecy Report, 2012-14. © Mondo Frazier, DBKP and End Times Prophecy Report, 2007-14. Unauthorized use and/or duplication of this material without express and written permission from this blog’s author and/or owner is strictly prohibited. Excerpts and links may be used, provided that full and clear credit is given to Jeremiah J. Jameson and End Times Prophecy Report with appropriate and specific direction to the original content. Possible first fragments of 1908 Tunguska meteorite! What is the purpose and who built these mysterious structures in Siberia? What happened in Tunguska in 1908?